Big beautiful seeds, too, that I roasted. But back to the warts. This sort of pumpkin (it’s really a squash, as are all pumpkins, even the standard jack-o-lantern types) is also called peanut pumpkin, bumpkin pumpkin, and probably other names (I don’t know the specific variety name of this one). 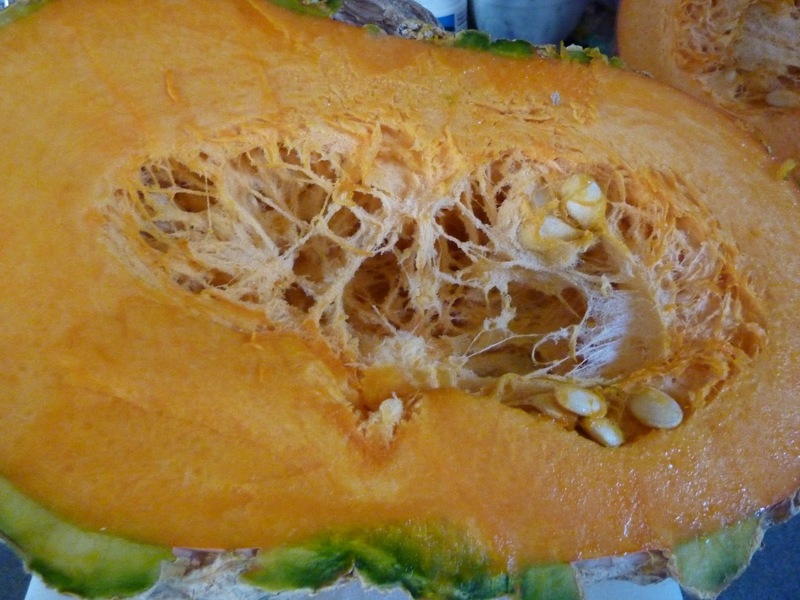 Some squashes naturally develop these warts, and this sort is carefully bred to enhance that tendency. 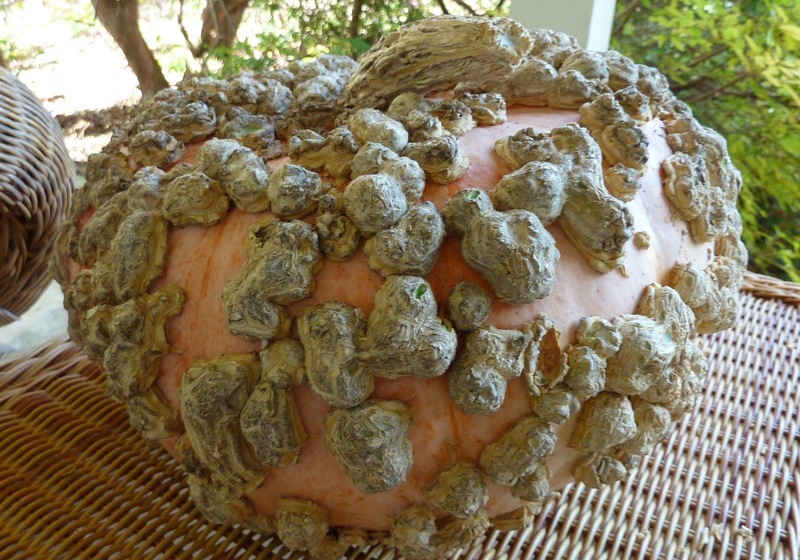 In 2009, a seed company tried to patent all warty pumpkins (see articles here and here) but since warts have been decorating pumpkins for centuries the attempt failed. It might also be interesting to use a little honey, brown sugar, or cinnamon. Anyway, then I separated the flesh from the skin and chopped it into 1-inch pieces. Next: saute a sliced medium onion (or half a really big sweet one) in olive oil or butter until tender and browning, then add the pumpkin chunks and keep stirring occasionally. I also added a bunch of fresh herbs I had on hand (dill, parsley, cress, chives – but whatever you have around that doesn’t clash is good) and salt, pepper, coriander and cumin. And garlic, of course. Add enough broth (and/or beer) to make it soup-like (the pumpkin itself will still release some liquid) and let it simmer for at least half an hour. Pureeing is optional, but I did an adequate job with my Really Old Immersion Blender, and it turned out well. And wow, yummy. Those warty pumpkins have a great taste. Maybe call it Herbed Pumpkin Soup, since you could make it with any type of pumpkin, or squash for that matter. The other squash dish we had recently (also courtesy of the farm market) used a Long Island Cheese and was based on this Dorie Greenspan recipe-in-progress (I like that approach to recipes, since just about all of mine are in progress constantly). My pumpkin was much bigger than hers, so I had to add extra filling, and used bulgur wheat with a little more liquid to cook it. I also included onions, sauteed a little ahead of time. It was a little goopy but good. 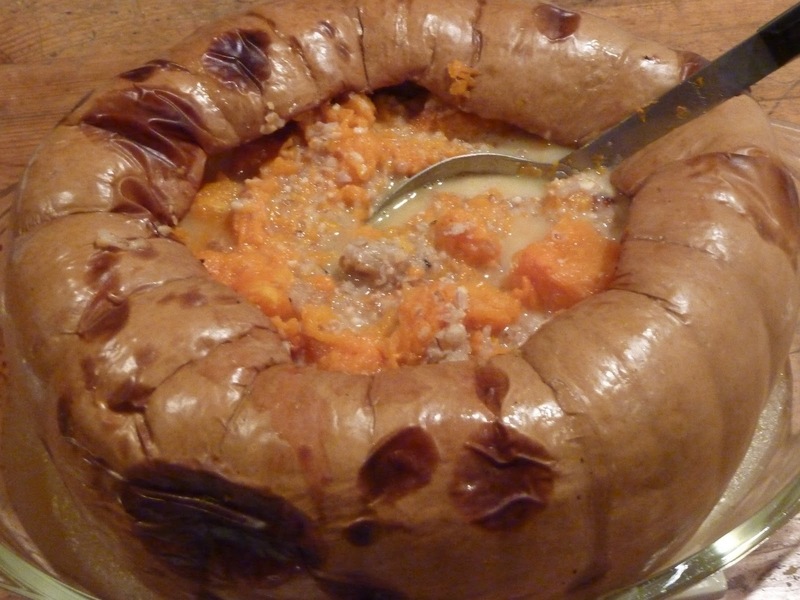 It would be interesting to try it without the cheese and with a more typical Thanksgiving-turkey kind of bread stuffing. But I will have to get another pumpkin for that, because the only remaining one from the farm stand is a big Cushaw, which is shaped wrong for stuffing. I’ll let you know later what I do with that one. I've made Curried Pumpkin/Butternut squash soup multiple times over the years to rave reviews. 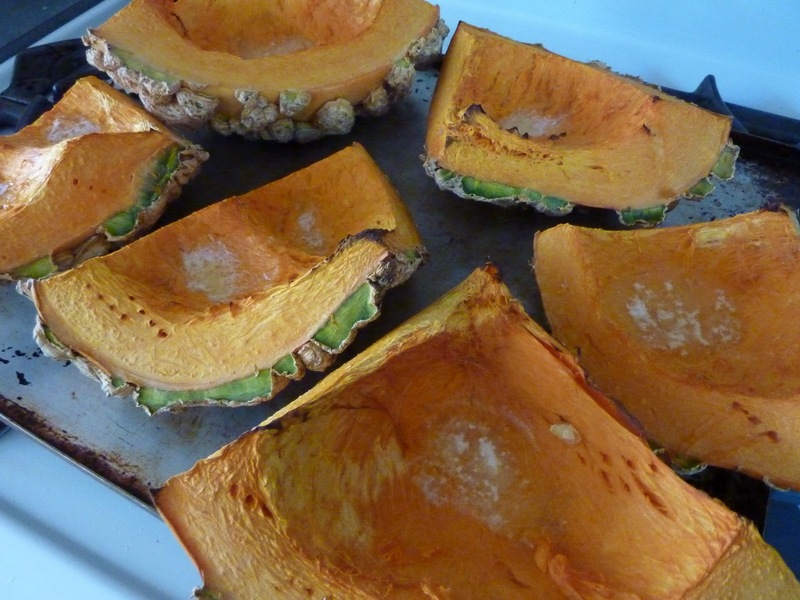 However, as you might have guessed, I don't have any pictures and I don't follow recipes :~/ Anyway, this one is very good, easy to follow, and can be used with fresh or canned pumpkin or squash- just not pumpkin pie mix. The curry paste makes it very hot. You could substitute 2 T of curry powder instead. Also, I don't think you need the apple or honey. The chopped fresh cilantro was an interesting touch. However, a dollop of sour cream, toasted pumpkin seeds, and a shake of ground nutmeg is also very good! Buon appetito!